The Amabeere Ga Nyina Mwiru Caves are one of the most interesting sights in western Uganda. The English translation of Amabeere Ga Nyina Mwiru” is “the breasts of Nyina Mwiru”. 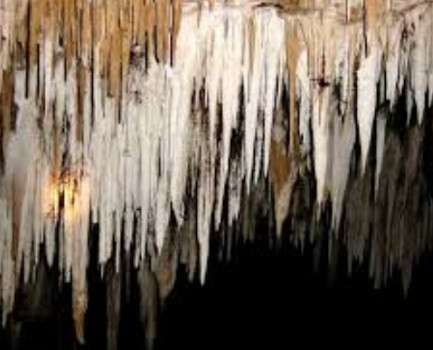 They are in actuality stalactites which are made up of calcium carbonate which when blended with water drip down and form the stalactites that you will find here. The dripping water looks milky because of the calcium carbonate. The locals call the milky dripping “breast milk” made to look milky by the calcium carbonate is called “breast milk” by the local people who live near the Amabeere Caves. Amabeere Caves and the three surrounding Explosion Crater Lakes make a visit to the area a most interesting half day adventure and it can be easily taken in on your way to Queen Elizabeth Park. These caves are hidden away in the Toro Kingdom found in Western Uganda. How do I get to the caves? There are often local guides, one of whom will take you down a thick jungle path which is sometimes quite slippery so sturdy shoes are important. The walk through the jungle is short and soon you will be greeted by waterfalls tumbling down the cliffs of the caves. It is quite a sight to behold.The caves are quite dark, so you will need a flash light to light your way through. The guides are very helpful, not only do they lead you carefully through the caves but also give you information and tell you stories and facts about the caves. Amabeere Ga Nyina Mwiru means “the breasts of Nyina Mwiru. According to local tradition and the Toro folklore the caves acquired the name after King Bukuku of Toro chopped off the breasts of his daughter Nyina Mwiru and had them thrown inside these caves, following a prophecy that the daughter would one day get married and have a son, Ndahura, who would kill the king and take over his throne. According to local legend the prophecy came true. The Amabeere Caves are a unique place to visit. Different from the popular mountain climbing and gorilla trekking adventures. Exploring these caves gives you a deeper knowledge of the people who live in the area, and their history and tradition. It can be quite enlightening. After you very educational visit to the Amabeere caves, take time to visit the nearby village and do some more cultural tourism, by interacting with the people and brightening up their day. You will be surprised how fulfilling an experience that can be.